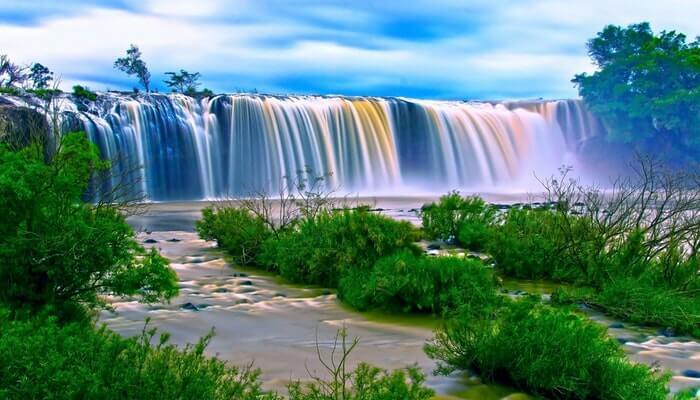 When you think of waterfalls, you may picture an exotic location far from home. But there’s no need to book a long trip to view a waterfall. There are many waterfalls in the U.S. to put on your itinerary for your next vacation. They are majestic, relaxing, and worth the trip. Toward the middle of New York state, you’ll find Pratt’s Falls within Pratt’s Falls Park near Syracuse. The waterfall is 137 feet high and surrounded by a rustic area for picnicking or participating in archery, which the area is known for. The county park itself does not have accommodations, but you can stay only a few miles away in the hotel of your choice. The park is open April through October and has a small entry charge per vehicle. If you’d like to see more, another waterfall is nearby at Chittenango Falls State Park. Located in a city by the same name, the famous Niagara Falls is about 20 miles from Buffalo, New York. Niagara Falls is on the border between the U.S. and Canada, and visitors with passports often tour the falls from both countries to enjoy different views. Getting wet is customary if you take the Maid of the Mist tour boat, or you can stay dry and check out the wonder from the Observation Tower. There are numerous hotels in the area, including those with spa getaways. Parking and walking paths that lead you to the falls are easily accessible. You may not realize it, but within a drive of just a few hours from Nashville, Tennessee, you can visit several waterfalls, such as Fall Creek Falls, located between Nashville and Chattanooga. You’ll feel like you’re escaping into nature at Fall Creek Falls State Park by staying in one of the cabins and dining at the on-site restaurant. A nature center, swimming pool, and golf course are also on-site. The park is easily accessible off Highway 284. Visit other nearby falls, too, such as Ozone Falls and Piney Falls. Oregon is home to many natural wonders, one of which is Multnomah Falls at the Hood River. The falls and the park are accessible year-round, but the springs that feed the falls are the most active in the winter and spring seasons. Cabins and camping are available on-site. Enjoy the area by going horseback riding, fishing, and hiking. For staying off-site, there are numerous hotels in the area, like the Multnomah Falls Lodge. Parking at the falls is available in several locations, and you can even just take a scenic drive while you’re in the park if you don’t want to get out of your car. Elaborately planned vacations on a beach or to another country are exciting, but sometimes you want to just get away and see some natural wonders closer to home. Some think that waterfalls are scarce, but in reality, there are hundreds of different sizes all around the United States. Do a little exploring and make some memories visiting one soon.